Beauty and the Bees’ Professor Fuzzworthy’s Gentleman Beard Shampoo Bar cares for your beard and your skin, too. It can be used from head-to-toe for the ultimate grooming experience. The Honest for Men Beard Wash by Maple Hill Naturals is the answer to men’s itchy beards. Its ingredients won’t be damaging to hair follicles to let your beard’s natural glow shine through. 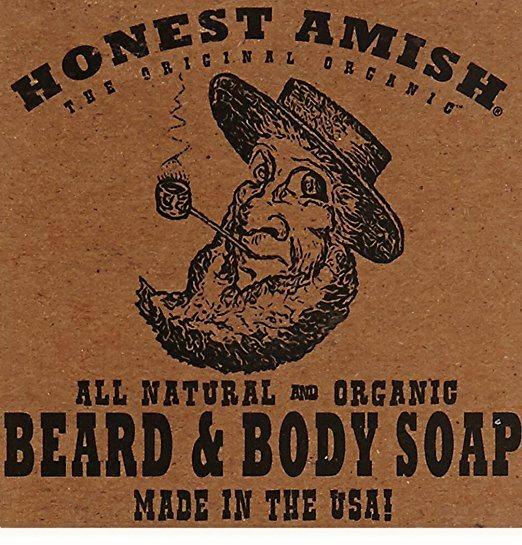 Made in small batches, the Original Beard and Body Soap by Honest Amish is one of those soaps whose quality you can trust. It is infused with essential oils so your beard doesn’t dry out. 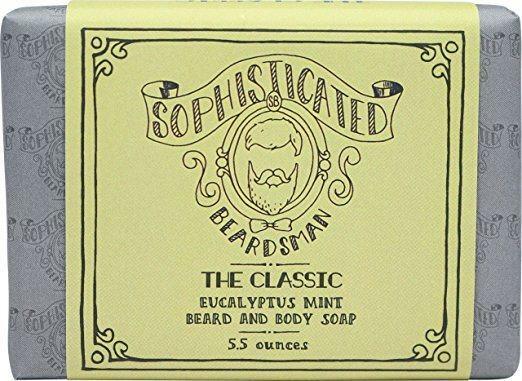 Filled with conditioning and hydrating qualities, Sophisticated Beardsman’s Eucalyptus Mint Scented Beard Wash Bar is the best solution to beard itch or beardruff. Best of all, they offer a money-back guarantee. Our last product, the FFS Beard Shampoo by Mr. Natty, is packed with antioxidants to protect against free radical damage. It is also infused with Shea butter to protect and soothe dry skin. This product is our choice for the best beard soap for all the right reasons. Aside from being an all-natural soap and chemical-free, it is the #1 choice not only on Amazon but in America, too. With conditioning oils, honey, and beeswax, it thoroughly yet gently cleanses beard leaving it shiny and healthy. It is easy to use, and as the brand says, is “often imitated but never equaled." This product is also infused with Kunzea oil. From Australia, this oil is known for its antibacterial properties and therefore, relieves skin from signs of itchiness. This beard soap works as a shampoo, too. Great for all hair types, this concentrated formula lathers easily and leaves hair shiny and soft. It has a woody smell to pair with your masculinity. Made from only the best ingredients, this product gives your beard the pampering it has been deprived of. It leaves beard moisturized and super soft that will make ladies asking for more. Made of 100% natural ingredients, this beard soap only uses top ingredients to ensure your beard looks its best. Free of chemicals, the ingredients in this soap can easily be pronounced. Made from a unique blend of oils and butters, this product conditions the skin and beard to stop itching and flaking. It won’t strip it of its oils which can dry out hair and thus, make it brittle. This product produces a good amount of lather and is very easy to rinse off. The soap has a sophisticated smell to it (mixture of patchouli, orange, and lavender) to help jumpstart your day. Aside from using natural ingredients, the company shows its love for nature through this soap’s packaging. It comes in a recycled paper board which is handy either at home or for travel. Great for sensitive skin, this beard soap won’t cause any rashes or irritation. It leaves skin super soft to the touch, and as one reviewer said, prevents women from having a “beard rash” after… you know what’s next. An organic product, this beard soap has a non-drying formula created to be a gentle beard and face cleanser. It follows strict quality control to ensure you only get the best with each purchase. This powerful cleanser and moisturizer contains a number of essential oils and can be used all over the body. It is infused with White Kaolin Clay that pulls out the impurities deep down. 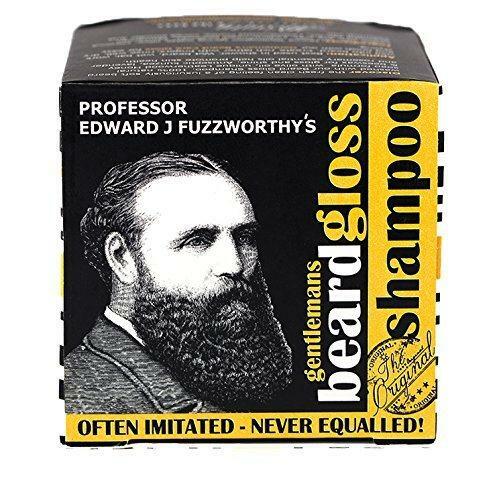 It creates a soft foam and makes beard extremely smooth and manageable. It also has a very subtle smell to it that’s not too overpowering and dissipates right after you shower. That’s unlike others that tend to linger on your skin. A little also goes a long way with this product. A single wipe from one ear to the other is literally all you’ll need to produce a good amount of lather, so with proper use, it’ll last you a long time. And with “proper,” we mean keeping it from flowing water—but isn’t that mere common sense? Great for all skin types, this product protects and moisturizes the skin since it is packed with a number of essential oils. It also prevents that itchy and dry feeling you get as your beard grows. Infused with Australian Olive Clay, this soap penetrates deep into the pores to give skin a deep clean. It is scented with mint and eucalyptus for a fresh smell that’ll rejuvenate your senses. Easy to lather, it feels comfortable and rinses off easily without leaving a waxy feeling on the skin. It cleans skin very well, but unfortunately, can melt pretty easily. Also, since it has peppermint and spearmint essential oils, we were hoping for some cooling sensation. Sadly there is none, so if you’re expecting the same, time to lower your expectations. But fortunately, they do offer a money-back guarantee. If for some reason they failed to keep you satisfied, they’ll immediately have the product refunded with no questions asked. No cooling effect considering it has peppermint, etc. Free of any irritants that could harm skin, this product is made to soothe and protect dry skin. The soap itself is placed inside the tin, which we find convenient and prevents further wastage. Olive oil is one of the key ingredients of this beard soap. Packed with antioxidants, olive oil is known to protect us from free radical damage and thus, helps slow down the aging process. In addition to this, this soap is also infused with Shea butter. This ingredient has a lot of skin-friendly benefits including repairing skin, boosting collagen production, and moisturizing skin. This product stands out because unlike the others, it is an exfoliating beard soap. Infused with rosemary, it restores the softness and shine of your beard by giving it a gentle, thorough clean. Gentle for everyday use, this product has a smell of peppermint to it that will surely rejuvenate your senses. It lathers really quickly and helps eliminate (not only reduce) any form of irritation. What Makes a Good Beard Soap? In a nutshell, men shouldn’t use regular bar soaps when shaving since they are packed with harmful chemicals that can strip off the skin’s (and beard’s) natural oils. This then makes hair weak and more vulnerable to breakage. When you use organic and natural beard soaps, it can be used daily compared to at least once a week when using regular soaps. But what exactly should the right beard soap contain? This is a no-brainer, but if your soap’s cleansing capability is poor, why use it? Choose one that has good reviews and if you tend to get dirty throughout the day, look for an exfoliating brand. The right beard soap does not strip off your beard’s natural oils. It should feel manageable as it dries, and by manageable, we mean tangle-free with some amount of volume. However, those with longer beards are the only ones who would greatly benefit from this. So if you only have a short beard, your beard soap is doing its job when your beard feels soft. Don’t expect a good beard soap to lather quickly since it doesn’t contain chemicals like regular soaps. But it should still lather easily so you don’t have to wait that long to make it work. Of course this is more of personal choice. But since your nose and beard are close to each other, at least pick one that doesn’t have an overpowering scent. Most beard soaps are bigger than your traditional bar soap and are constructed in a way that they are easy to hold onto. Their large sizes also mean you definitely get your money’s worth. Always opt for natural ingredients. If an ingredient is something you don’t recognize or pronounce easily, you may want to go for another one. We tend to forget that our beard has needs of its own. Buying beard soaps seem unnecessary for some, but we guarantee you it will benefit your beard in ways you never thought possible. The Professor Fuzzworthy’s Gentleman Beard Shampoo Bar by Beauty and the Bees is today’s winner as the best beard soap. It is not only recommended by us but by hundreds of Amazon customers, too. Made from natural ingredients, this soap helps maintain the softness and health of every man’s beard. It is also very affordable so if you’re looking for a good quality soap, look no more.